Speeding is dangerous for any motorist as it endangers everyone on the road. This is particularly true when the speeding driver is behind the wheel of a hulking tractor-trailer, which can weigh up to 80,000 pounds when fully loaded. Tractor-trailers, big-rigs, and other large commercial vehicles can cause devastating accidents even when speed isn't involved. Sadly, in cases where speed was a factor, the results can be catastrophic or even deadly. If you were injured—or lost a loved one—in a tractor-trailer crash caused by a speeding commercial truck driver, you may be entitled to compensation for damages. Here's what you need to know if you're considering taking legal action. Accidents in which speeding was a factor killed more than 10,000 people in 2016 alone, according to the National Highway Traffic Safety Administration (NHTSA). Speeding was a factor in 27 percent of fatal motor vehicle accidents in 2016. 18 percent of drivers involved in fatal crashes were speeding at the time of the accident. 37 percent of speeding drivers killed in 2016 were under the influence of alcohol at the time of the crash. In 2016, speeding played a role in 17 percent of large truck crashes, according to the Federal Motor Carrier Safety Administration (FMCSA). Approximately 112,000 drivers are ticketed for speeding every day in the United States. Nearly 41 million speeding tickets are issued each year. The estimated total economic impact of speeding-related accidents averages $40 billion per year. Carefully documenting these injuries with their doctor can help tractor-trailer accident victims—and their personal injury attorneys—build a strong case for collecting compensation. In addition to economic and non-economic damages, a third type of damages—known as punitive damages—may be awarded in cases where the defendant's conduct was particularly heinous. An attorney can advise clients on whether this type of damages may apply to their case. A serious tractor-trailer accident can turn a person's entire world upside down, but a knowledgeable personal injury attorney can help you fight for the compensation you need to get back on your feet. If you were injured in a tractor-trailer accident caused by a speeding truck driver, the skilled attorneys with the Morris James Personal Injury Group can help you understand your rights and options. Contact us today to schedule an appointment for a free initial consultation to discuss the details of your truck accident case with a member of our seasoned legal team. 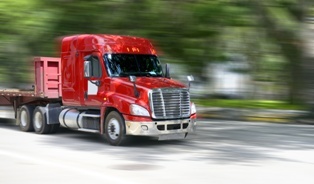 Is a Trucker or Trucking Company Liable for My Injuries?